Since my tablet orientation is usually on landscape, I started playing the game like that. Unfortunately, even after fiddling around with scaling the size of the gameplay area, the keyboard would still cover a bit of the game. The other option was to shrink the gameplay area to the point that it was a tiny little thing. I didn’t want that since I had to rely on tapping on structures and units to move around. 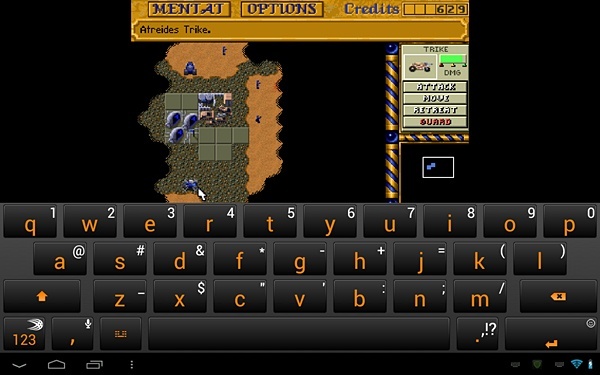 I think it may be possible to play the game as keyboard-only but it’s kind of clunky. I find that the best approach at playing Dune II is to use the mouse for selecting structures and units and keyboard shortcuts for actual building, repairing, moving, and attacking. In the end, I opted to use portrait mode so that I could have the entire play area without worrying about the keyboard hogging up some real estate. Yay~! The keyboard is far away from the game itself! I sort of want to see how Wing Commander II will play on this but I’d have to use a keyboard that has a Tab button and easy access to the + and – (I think) keys for speeding up and slowing down the ships. I guess I’d leave WC2 emulation to my laptop or eventual desktop system instead. Ha. Patches and trainers for Dune II. 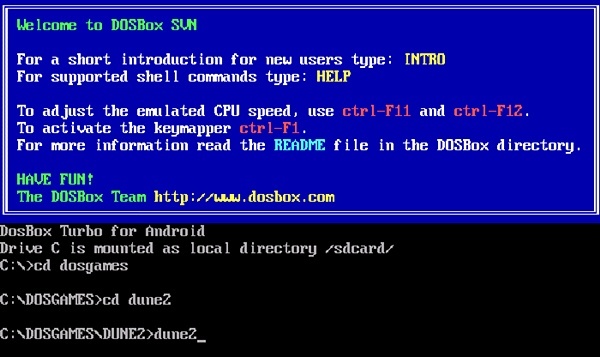 I wonder how they would work on an emulator with a keyboard that has no Function keys? (Edit: Duh, there’s a full keyboard called Hacker’s Keyboard that gives people access to them.) 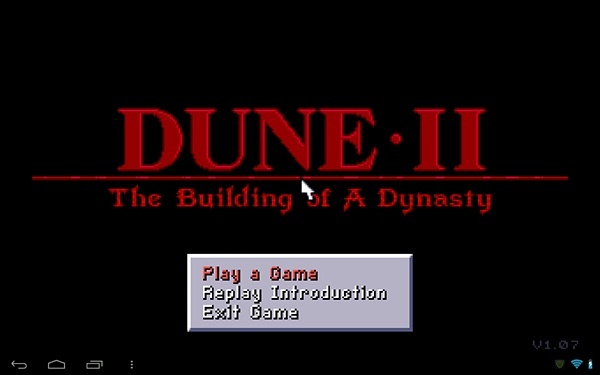 Anyway, Dune II was the one RTS game I could playthrough without cheating. Let’s see if I can do it again (assuming I’ll stick with it until the end). Dealing with Sandworms might be a bit more annoying on the tablet though since it’s easy to accidentally select a spot that you don’t mean to. ^^ For example, in the screencap above showing the game in landscape mode, I didn’t mean to put the windtrap where it is. >_> I somehow missed the two concrete slabs at the top while placing it. Sigh.